Party On Purim - Plan For Pesach! 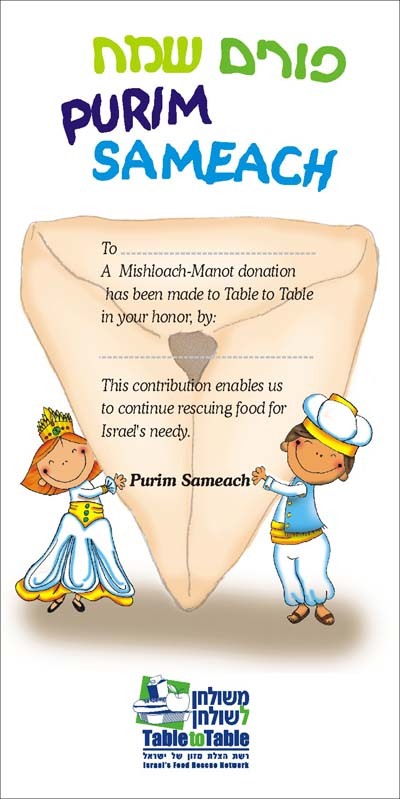 In lieu of giving Mishloach Manot, people can fund Table to Table's ongoing food rescue work benefitting Israel's needy, as well as the Female Hebrew Benevolent Society which supports the poor in Philadelphia's Jewish community. Purim! Merrymaking and revelry, baking, giving and receiving delectibles, joining in community to hear the reading of Megillat Esther and to watch Purim schpiels . . . these are just some of the associations we have with Purim. One big association I have with this festive holiday, though, is the looming gargantuan feat of having to prepare for Passover! Oy, the cleaning the scrubbing, the shopping, the storing... But Passover is months away, you are thinking. We should have only visions of hamantaschen dancing in our heads! Of course we should. Yet since Passover follows Purim by just four weeks (Purim is on the 14th of Adar, which this year is March 21 – Passover begins on the 13th of Nissan, April 19th), for many of us, thoughts of Passover and its numerous preparations hover alongside those of getting ready for Purim. Knowing this is a universal predicament, below are some ideas and recipes for a fun and joyful Purim, with an accent on hamantaschen. This is followed by some tips to jumpstart preparations for a stress-free Pesach. Two of these Purim customs have to do with food, with hamantaschen being the treat most emblematic of the holiday. However, whether hamantaschen is the Number One Jewish Treat is debatable – literally! In 1946 a group of scholars at the University of Chicago set their minds to a public academic debate over which was the preferred (and perhaps even the morally superior) Jewish food – potato latkes or hamantaschen. 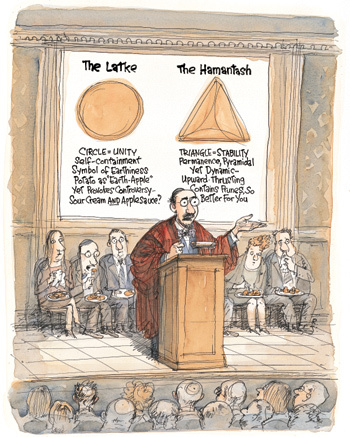 This now annual event caught on at Harvard University and many other arenas, and is chronicled in the book The Great Latke-Hamentash Debate by Ruth Fredman Cernea. At this time of year, hamantaschen wins! Yet even though the focus of my column is food – how could I not include some resources for costume ideas, Megillat Esther, and making a difference this Purim? But I suspect what you really want are some good new hamantaschen recipes. Making hamantaschen, packing them for mishloach manot, and trying all the varieties definitely raises the level of joy and anticipation in our house. I’m usually most partial to hamantaschen made with cookie dough, but I’ve also enjoyed them made from raised yeast dough, and some that are more like cake. This year I’m giving special pride of place to the wonderful hamantaschen that used to be made each year by my 91-year-old neighbor, Ed Snyder. Although it has become harder and harder for him to keep up the tradition, his delightful contribution to Jewish cuisine will be carried on, hopefully for generations, as is the case with so many of our treasured recipes. One way to make this happen is to invite your children, other family, and friends to join you in the preparation. Using a food processor, coarsely chop prunes, raisins, and lemon rind until thoroughly combined, then add chopped nuts, sugar, lemon juice, cinnamon, and grated apple. Mix thoroughly. Preheat oven to 375. Mix dough ingredients in order given. Chill. Roll out in small amounts on well-floured board. Cut 2- or 3-inch rounds. Fill with 1/2 tablespoon or more of filling, depending on size. Shape dough into triangle. Pinch openings together. Bake on a greased cookie sheet or on baking parchment for 30 minutes, or until golden brown. Sift the sugar, flour, baking powder, and salt into a bowl. Work in the shortening by hand. Add the egg and orange juice, mixing until dough is formed. Chill overnight if possible, or at least two hours. Roll out the dough about 1/8 inch thick on a lightly floured board. Cut into 3-inch circles (a teacup works). Place one heaping teaspoonful of the filling in each. Pinch three edges of the dough together (use a knife or spatula to lift the edges), but leave a small opening in the center; the resulting pastry will be in the shape of a triangle with a little of the filling showing. Place on a greased cookie sheet. Cover with a cloth and set aside for 1/2 hour. Preheat the oven to 400 degrees. Baste hamantaschen with beaten egg for a shinier crust, if desired. Bake hamantaschen for about 20 minutes, or until delicately browned on top. This fun recipe is adapted from one on aish.com. In a large mixer combine margarine, sugar, egg and vanilla until fluffy. In a separate bowl, combine all dry ingredients. Add to mixer and mix briefly to blend. Refrigerate dough for at least 1 hour or chill in the freezer for 10-15 minutes. Divide dough into quarters. Roll into 1/4-inch thickness on a lightly floured board. Cut out 3-inch rounds. Reroll scraps. Place filling in the center of each dough round. Fold three sides up to form a triangle, leaving some filling exposed in the center. Place cookies 2 inches apart on greased cookie sheets. Bake for 15-17 minutes or until crisp. Transfer to a wire rack to cool. Several years ago I was blessed to discover a wonderful resource: Countdown to the Seder: Personal Pesach Planner, a companion to Spice and Spirit Kosher for Passover Cookbook, both published by Lubavitch Women’s Cookbook Publications. Part I of the book contains a discussion and guidance on the essential stages of Pesach preparation – cleaning, shopping, and preparing Seder foods – as well as a guide to transmitting tradition. This section is written as both a planner and an educational guide, and though it is directed in large part toward orthodox/traditional observance, it is very accessible to the less observant. A thorough glossary of Hebrew terms is provided. Part II includes over 25 checklists and timetables that I have found to be invaluable in planning from year to year – such as a Passover budget worksheet, an alphabetical and room-by-room cleaning checklist, and a kitchen inventory. There is also ample space designated for notes. Over the years, I have jotted lists of possible Passover menus and new dishes to try, reminders of things to purchase for the following year’s Seder, and names of people to invite. I’ve kept a mini journal of things that worked that I want to make a tradition and things that didn’t turn out so great. The book is now only $10 if you buy it online – which I think is a great value. Are you planning on hosting a Seder this year? Now is a good time to think of guests to invite. Maybe there’s someone you know whose family is far away and he or she might be alone, or there’s a family you’ve wanted to share time with. My congregation has a Seder matchmaking service where people with room at their table are connected with folks looking to attend a Seder. You’ll want to make sure to inquire about any food sensitivities, cat allergies and the like, to avoid unhappy surprises when it’s too late. Next month’s column will be devoted entirely to Passover menus and recipes. If you have a beloved family Pesach recipe you’d like to share with readers of The Kosher Table, send it to me at food @ pjvoice.com.